Slotblox (or "Cashblox" as it’s sometimes referred to) is a completely luck-based version of Tetris. 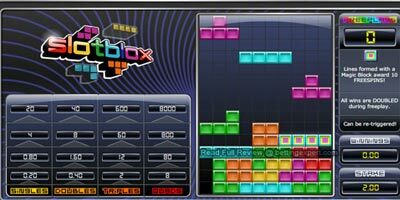 You simply click a button, watch those famous Tetris-shaped blocks drop and hope that you make some lines. Slotblox brings the look and feel of some of the all-time glassic arcade puzzlers to the online casino world with this new fixed-odds game. • When you press play a series of blocks in various shapes will drop from the top of the screen into the grid. • You don't have any control over the blocks. • Whenever a row is completed, that row disappears, so the more rows you get, the longer the game lasts - and that means more chances of winning! If one or more rows are completed, the game will pay out according to the paytable. o When you complete a line featuring a MAGIC BLOCK, the game will reward you with 10 free plays. o You'll be taken straight to FREE PLAYS mode - the screen background colour will change and a message will flash saying "10 Free Plays". o All wins during Free Plays mode are doubled. Free Plays can be re-triggered during Free Plays mode. o At the end of Free Plays, a message will display the total amount won during Free Plays mode. Totesport: claim your free spins, no deposit bonus or welcome package here! "Slotblox * How to Play * 5 Pound free"